Gulf Shores Alabama House For Sale. This lagoon-front property has 2,365+/- s.f. and is located in an awesome subdivision with deeded beach access. Large lot 100 ft. wide with great landscaping. The master BR encompasses the east side of the home, providing Lagoon and Gulf views. Large kitchen and open living room is ideal for family gathering and entertaining friends. The gulf-side deck wraps around to the large lagoon deck. 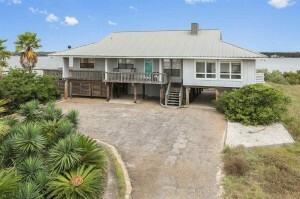 The lagoon side of this 4 BR, 3 BA house is partially fenced for pets…the residence also has a walkway to the pier and boat lift. A PVC bulkhead spans the entire waterfront….deeded beach access is a quick walk across the street. The amount of landscaping is rare for a lagoon property, and it is maintained via a well pump for irrigation. Come see this one – it could be the one for you and your family!